View from the roof of the Union Square Cinema. Arguably their most remarkable invention to date, or at any rate the one that has a whole lot of people talking, is based on two conceptual breakthroughs. The first isn’t so much a breakthrough as a recovery of long-lost knowledge. For through an extended process of investigation, the Twins arrived at an insight. Contrary to virtually every representation in our daily lives, which following the lead of Renaissance thinkers envisions us as fording into the world, gazing straight ahead, as if through a flat window (paintings, television, movies, computer monitors, the magazine page before you), in fact, each of us experiences the world as if we were inside, at the center of, a giant perceptual sphere. Indeed, they came to realize, if you are going to represent the world, something has to be curved—be it the line (as on a Mercator projection), or else the lens (in photography), or else … And here came their first insight: why not the paper? 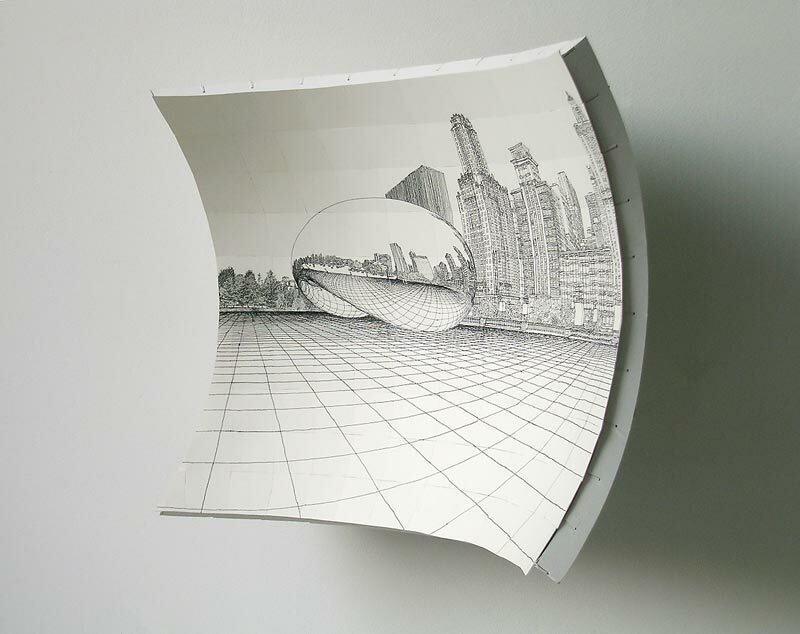 Wouldn’t it be truer to the feel of vision as we actually experience it if one rendered a scene on a piece of paper shaped like a tranche of the inner lining of a sphere? And as I say, in so thinking, they were precisely upending the Renaissance way of visualizing the world that has held sway ever since the breakthroughs of Brunelleschi and Van Eyk and the other giants of the early fifteenth century, one which in turn had itself been grounded in the overthrow of the prior antique/classical/medieval model of ourselves as living, precisely, at the center of a giant sphere. Their second breakthrough, the one that has artists in particular so astonished, is that the Twins have figured out a way of rendering the world before them onto that curved sheet of paper, in fact of tracing the world onto that page freehand, as if by way of a camera obscura or a camera lucida projection, only without any equipment whatsoever beyond their own binocular vision, or more to the point, their visual cortex—deploying the same innate capacities that allow any of us to see past our doubled ghost thumb out onto the vantage before us. A few months ago, I called on the Oakes Twins in the diminutive basement one-room apartment, just east of Union Square in New York City, that doubles these days as both their teeming workspace and their compact homepad (a set of narrow bunk beds tucked neatly into one corner). The boys are on the tallish side of average, thin, clean-cut, and somewhat more than conventionally handsome; assiduously well-mannered and deferential and yet at the same time eminently self-assured. It turns out that their current investigations wend all the way back to their earliest years as the children of a social worker father (Larry, referred to as “Lar” by the boys) and an itinerant academic mother specializing in children’s literature (Elizabeth Poe, a distant relative, as it happens, of the brooding poet, who always gets referred to by the Twins, her only children, as “Poe”). The way other identical twins might invent a spooky secret language, the two of them became engaged in a long-term conversation, a continuous tandem investigation into the very fundaments of visual perception. “On long drives,” Trevor recalls, “we used to talk about the way a bug splattered on the windshield would appear to double if you looked out beyond it, and what then happened when you tilted your head from side to side.” How old were they when they were doing this? “Oh,” surmises Ryan, “three or four.” They’d dissect the foreshortening of approaching rows of telephone poles, tapping out rhythms with their fingers in syncopation with the passing poles, and they’d talk about that. They spent a lot of time analyzing their parents’ potential sightlines as they hid in a pantry or up on the garage roof behind the basketball backboard. (What for other kids was just hide-and-seek for them proved but one more occasion for investigation into optical geometry.) Poe recalls how for a time Trevor used to go around saluting, “Aye, Aye!” and then pointing to his eyeballs, giggling, “Eye, eye!” And how they were both able to freehand quite expressive versions of Garfield as early as age three. And how when their parents took them to see a children’s theater production of The Wizard of Oz a few years later, the thing that had the two of them most captivated wasn’t anything transpiring on stage but rather the mechanics of the lighting. Some years after that, the boys would find themselves sitting on stumps about twenty feet apart, gazing off into the distance, and trying to imagine what the depth perception of a being with eyes twenty feet apart might be like. “Pretty cool,” they agreed. On the other hand (or perhaps as another aspect of the same general cognitive horizon), they were both profoundly dyslexic. In a house jammed with children’s books, for the longest time, well into the sixth grade, the Twins could hardly decipher a thing. “To our mother’s chagrin,” says Trevor. “Well, not chagrin,” corrects Ryan, “more like dismay.” “Yeah,” agrees Trevor. “Dismay.” They simply couldn’t manage to blend the letters (quite remarkable, when one thinks about it, in a pair of twins who in later years would find themselves veritably slicing and dicing the visual process, the better to comprehend its inner workings). Meanwhile, they excelled in practically everything else: acing math, for example (except for word problems). “We had them on both handicapped and gifted tracks simultaneously,” Poe recalls. Indeed, their twinship has seemed of the essence to both their method and their achievement all along. The sort of conversation most singletons have with themselves— the kind of thing Hannah Arendt, following Socrates, characterized as the very essence of thinking—twins are sometimes in a position to have with one another. How much more telling that general possibility can be when the conversation in question turns out to be about binocularity—two individuals completely in synch in an ongoing investigation into what it means to see with two eyes. 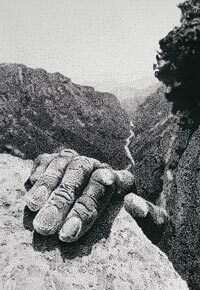 Ryan’s high school stipple drawing of a hand reaching over a cliff ledge. Seeing, and seeing with two eyes, was at any rate forming one of the principle motifs of the Twins’ work by the time they got to high school. The walls of the Oakes’ parents’ home today is festooned with such early experiments, hung about like so many instances of sloughed-off skin, and it was fun being given the tour by their obviously proud, if still somewhat bewildered, parents (“I have yet to cease being amazed at how things keep developing for the two of them,” admitted Larry). But in the end, two images really jumped out at me as harbingers of things to come. 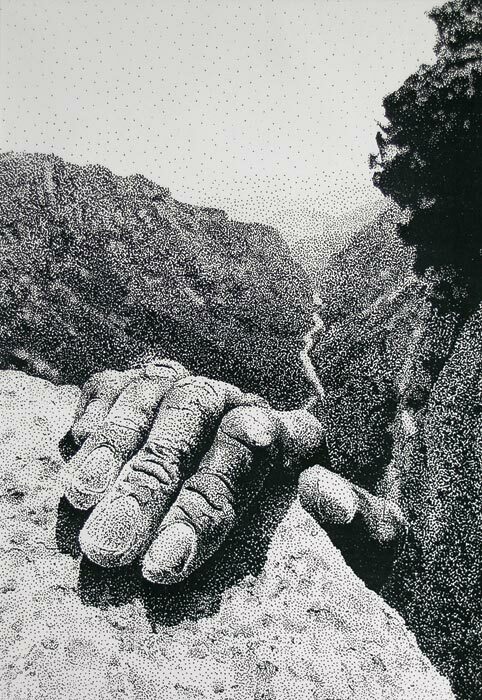 One, Ryan’s response to an assignment that he draw something in the stipple style—the view from high up a cliff with a close-up on a rock-climber’s knuckles just then clambering up over the ledge—already testified to an exceptional level of ambition and self-certainty: Climbing Mt. Perspective. The other, from Trevor’s junior year, arose as part of a yearlong series entirely given over to bagels—rhapsodic bagels, cubist bagels, close-up bagels, bagel sculptures, and bagel oils (“The award this year goes to Trevor for his bagel series,” announced the principal at that semester’s year-end ceremony, “though, Trevor, don’t you think it’s about time you learned to spell bagel?”). 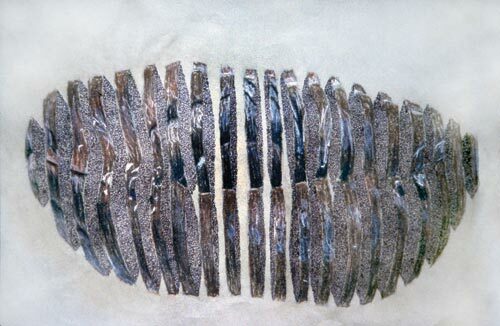 The specific bagel image I have in mind is this one—talk about sliced and diced premonitions. Such, at any rate, were the sorts of things Trevor and Ryan brought along to the various portfolio days that art schools kept holding their last years of high school, including one at the Corcoran in Washington, D.C., for New York City’s Cooper Union—an institution notoriously difficult to get into for any single applicant, let alone two, since only sixty students are admitted each year from throughout the country, and all with full four-year scholarships. But in an unprecedented development, both twins were admitted, on the basis of the separate excellences of their applications, and both decided to go. Trevor’s high school “sliced bagel” drawing. The first year at Cooper Union was given over to classes in the so-called fundamentals, with the student body divided into sectional groupings of fifteen students each, and the Twins were assigned to separate sections (the better to foster individual development, as far as the authorities were concerned), which was fine by them. Indeed, all the way through school, they’d make a point of signing up for different sorts of classes (Ryan taking more painting and drawing, Trevor more sculpture). “We looked at it as a way of surveying a wider range of what Cooper Union had to offer,” says Ryan, “because we could always share information and techniques. And we didn’t need to be exposed to the same things for our thought process to keep moving along on a similar keel.” And indeed, they shared dorm rooms and studio space throughout. Not infrequently, depending on their relative immediate workloads any given week, they would do each other’s homework (the academic equivalent of dating the same girl, unbeknownst to her). “Perfectly acceptable to us,” says Ryan (referring to the homework, while declining to comment on the question of girls). For his part, from early on, Ryan focused on ways of “justifying the marks,” as he puts it, accounting as rigorously as possible for why and how his energy was getting expressed on any given surface before him, and on how to keep such expression from turning merely arbitrary. Thus, for example, that first winter, he spent a lot of time staring out his dorm window, recording onto the page before him the way individual flakes of snow fell, one transit layered atop the next—letting wind and gravity dictate the work’s outcome. In similar fashion, he’d start spending hour upon hour fashioning his own brushes, as a way of tending to (and indeed intending) another aspect of the process he otherwise found overly arbitrary. Trevor, for his part, took some corrugated cardboard panels and cut them into three-inch squares, piling those squares one atop the next (the corrugations all running parallel) so as to form three-inch laminated cubes, which he then started placing one beside the next, though with thin little shim-wedges at the back between each cube, thereby presently enforcing a gentle curve in the ever-lengthening row (a curve he would come to recognize as the inner arc of a wide circle). The extended nine-foot-long cardboard-cube array eventually read as completely opaque, a solid brown wall, unless, that is, you happened to drift over to one particular spot, about fifteen feet away (the center, as it were, of the circle in question), at which point all the corrugations lined up and (magic!) the wall seemed to disappear entirely. 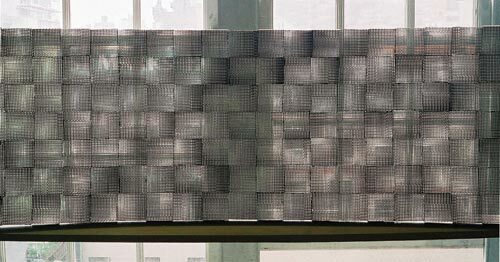 Trevor’s nine-row, corrugated cardboard wall piece—opaque when viewed obliquely (top) and see-through (bottom) when viewed directly. Meanwhile, their more general perceptual inquiries continued unabated. They grew ever more fascinated by peripheral vision, and in particular the way it is experienced corporeally from out of the contours of the human face—the way for instance the field of vision seems wider horizontally than vertically (understandable when you realize that your eyes are placed horizontally one beside, rather than atop, the other in your face, and that furthermore your jutting brow ridge tends to interfere with the view looking up, which is also suggestive of an evolutionary prehistory in which our ancestors were more likely to face threats from the ground than from the sky). Testing the limits of their perceptual field, come nightfall, they would climb to the roof deck of their seven-story dorm and lie horizontally, their heads tilted back slightly (to compensate for that annoying brow ridge) and realize, to their astonishment, that in that manner they were able to take in not only the full hemisphere of stars above but also virtually the entire 360 degrees of the surrounding girdle of city lights. Human perception! There were the conversations as well in which they began to take note of the curious way in which their noses severely narrowed the expanse of their depth of field. They became convinced that a person’s nose, even though usually occluded by the operations of his visual cortex such that it tended to disappear from view, served to anchor the scene before him, though not in the way one might expect, as a beacon pointing the way ahead right down the middle of his visual field. Rather, it might be more accurate, in considering bifocal vision, to think of the nose as appearing doubled to either side of the visual field, as if it were bracketing or bookending the scene before us (blocking the right eye’s leftmost view, and the left eye’s rightmost). And this was a phenomenon, they came to feel, with implications not only for vision generally but for art-making in particular. 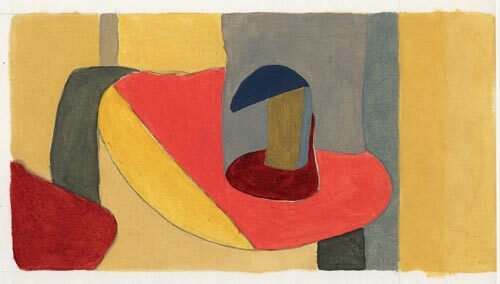 One day Ryan was studying a recent suite of abstract paintings by Trevor and, never one to accept the arbitrary nature of anyone’s mark, he took to focusing in particular on a seemingly recurrent triangular motif off in the lower corner of several of the paintings. “Wait a second, Trevor,” he announced exultantly. “That’s our nose!” Such shapes appeared not only in Trevor’s paintings but in those of other students as well. And indeed, come to think of it, in those of all sorts of other, far more accomplished artists. 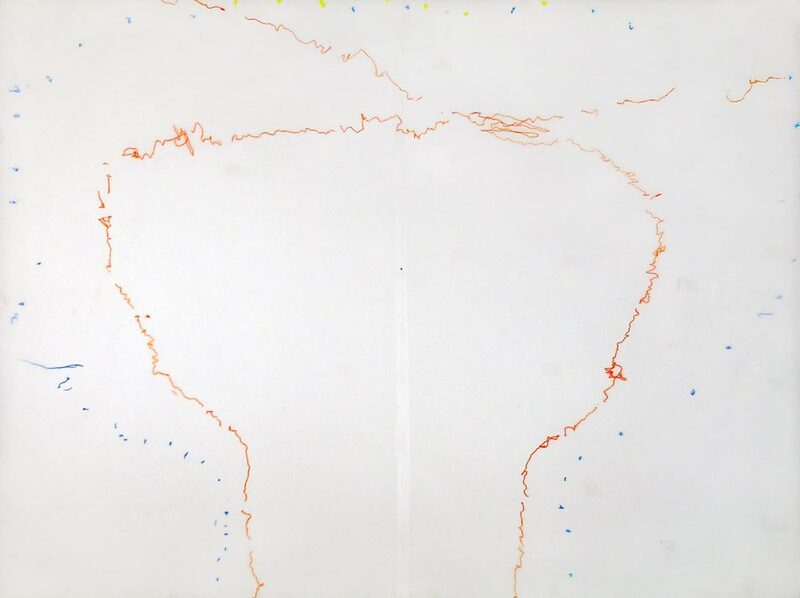 One of Trevor’s abstract paintings, with nose-like intrusion at lower left. Soon the two of them extended these nose investigations with more analytic rigor, literally mapping the contours of their own depth perception by each, with one eye closed and then the other, having the other twin record the precise place where a laser dot first appeared beyond their nose as it slowly made its way across a screen opposite. The result in both cases, variations on a shield-like shape (denoting the shape of the respective visual fields in which they were able to see the laser dot with both eyes, as opposed to just one or the other, and hence with any degree of depth perception), gave rise to further considerations. For example, could it be that actual shields (the antique or medieval armor kind) served not only to protect their owners from their opponent’s attack but, perhaps just as importantly, to forestall anticipation of the direction from which their own next attack would be coming, precisely by blocking out their opponents’ entire zone of depth-perception? When they raised this possibility with neurologist Oliver Sacks recently, he in turn noted how it has long been noted in literature that lepers (whose noses have fallen off) display preternaturally good depth perception; he also surmised that in much the way basketball selects for tall people, this might explain why boxing seems to select for flat-nosed individuals (which is to say that boxers don’t come by their flat noses from getting hit while boxing; instead, all things being equal, having flat noses going into competition would make them less likely to get hit in the face in the first place). David Hockney, with whom the Twins recently spent an entire afternoon in concentrated discussion, recalled the painting of a long-ago nobleman whose nose was conspicuously out of whack, on account of the fact that being blind in one eye, or so the story goes, he’d had part of it carved away to give himself a wider field of vision. During sophomore year Trevor lavished months and months on the creation of a truly gorgeous matchstick hemisphere. And the longer he labored over the thing, the more the boys began to realize that the object was evincing a remarkable property: if you turned it over, every single one of the nine thousand individual matchsticks was (of course, now that you stopped to think about it) aimed at the same focal point at the hollow center of the hemisphere. 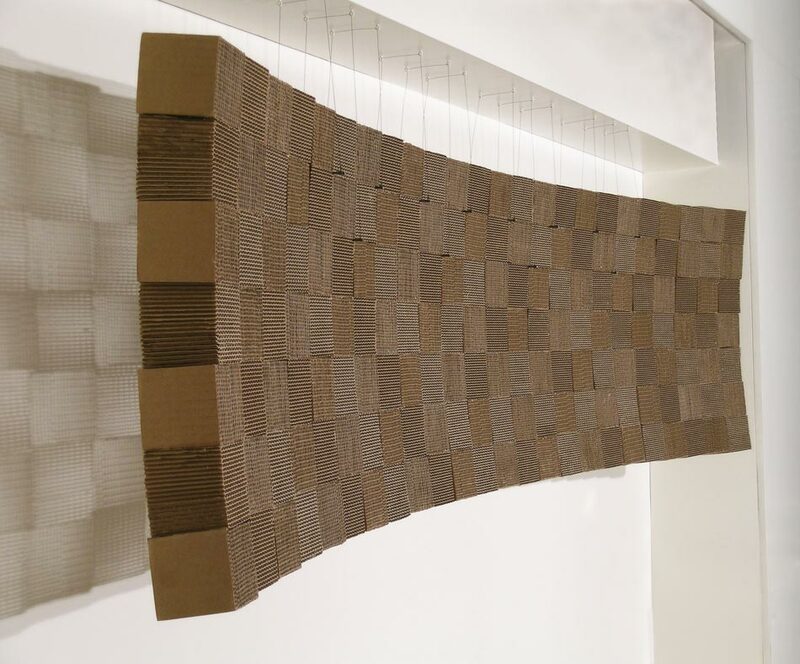 Thus inspired, Trevor returned to his corrugated cardboard sculpture and decided to extend it as well, laying eight rows vertically atop the original arcing length of wall, except not straight up vertically, but rather curling inward (through the regular deployment of further shims), such that the resulting wall now read as a tranche of the inside of a sphere, with all its corrugated hollows pointed at the same vanishing point, from which place the seemingly opaque piece once again (only even more startlingly) suddenly disappeared. Two views of Trevor’s matchstick dome. These material investigations (Trevor thinking, as ever, with his originary tools) set the stage for a series of conceptual breakthroughs by the Twins working in tandem. For starters, they quickly recognized that the match dome mimicked, or anyway modeled, both the way light beams sped out from a single light source, say the sun or a lightbulb, and the way they sped into the eye itself. Then one really bright spring day, as they sat in a Central Park grove out behind the Metropolitan Museum, “under a pink blossoming tree, looking at a dark brown tree branch,” as Ryan recalls, they suddenly realized they were surrounded by, or immersed in, a “hyper-saturated foam” of such light-splays. The sun sent out its infinity of light beams; any single one of those beams might hit, say, a spot on a pink blossoming branch, provoking another spherical explosion of light beams, only one of which would enter any given eye, along with the infinity of other converging discrete beams ricocheting off the infinity of other surfaces. The eye in turn would be gathering its own infinity of beams, from all of those surfaces, some farther off than others. Indeed, as the Twins now began to characterize the process, binocular depth focus was “like eating with chopsticks,” the sight lines from each eye intersecting, like chopstick tips grasping food, on whatever detail of the visual field one happened to be focusing on at the moment. This in turn helped to account for the double-ghosting of objects intervening in front of that distant point of focus (farther up the separate chopstick stalks, as it were), which they were also beginning to notice. By this time (junior year), they had moved into the basement digs that have served as their home base to this day. Trevor decided he was going to try to contrive a silkscreen roomscape that would be true to the act of looking as he was fast coming to understand it, complete with double ghosts. The complexities involved (including getting one eye to focus on a nearby object, the other on one further away) were proving incredibly daunting. 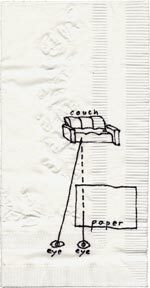 Trevor’s bookmark slice of the couch drawing. Thereafter, Trevor and Ryan together quickly began perfecting the technique: drawing a bookmark slice and then folding that part of the page back and drawing the next slice over, and then folding that next part of the page, until they’d been able to draw, or actually rather trace, an entire scene with uncanny precision. 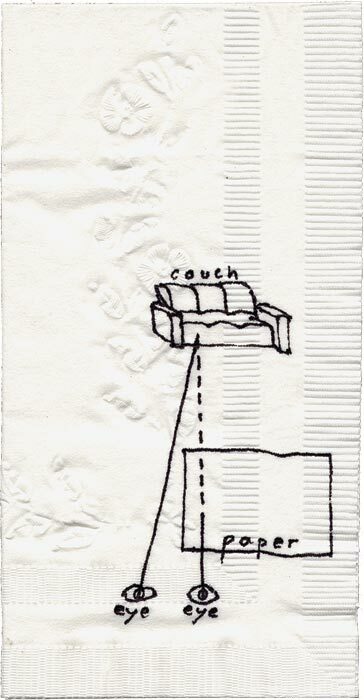 Trevor’s napkin illus­tration of how his couch drawing was created. 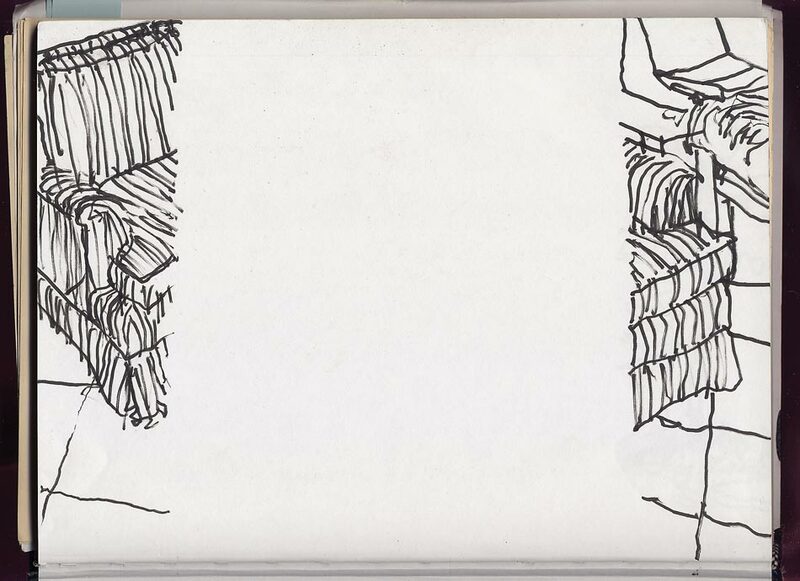 But there was a problem: the bookmark analogy wasn’t quite exact. For in fact the ghost image “projected” onto the page was wider at both the top and the bottom of the page. It stood to reason if you thought about it: this was simply another instance of the kind of distortions that plague all conventional perspective systems, the reason Greenland looms so much bigger than it actually is on a Mercator projection (Newtonian physics sufficing, as it were, for most operations at the middle of our experience but breaking up into curved Einsteinian vistas at the extremes). They couldn’t simply bend back the page along the curved expanse, since the next slice would prove even more curved. Momentarily flummoxed, they looked over at Trevor’s matchstick dome, and a light bulb suddenly seemed to go off over Manhattan, somewhere to the side of Union Square, shedding insights in every direction. What would it be like, they wondered, if they could find a way of drawing on the inside of a sphere? Or rather, if they could, as it were, press a traditional gridded rectangle into the form of spheroidal segment and then use the interior surface of the thus smeared-out grid as a drawing platform? Each square would naturally pinch into a sort of parallelogram, with the tiles toward the center pretty much square and those toward the corners and edges growing progressively more diamond-shaped (the lengths of the sides of each parallelogram would of course remain equal and unchanged). One would also have to custom-shape each pinched “square” of paper accordingly (sort of like the tiles on the space shuttle). But were one able to contrive such a concave grid, one might then imagine securing it atop a tripod easel, with a headrest at the center to hold one’s eyes steady. Or rather one’s left eye, since with one’s right one would need to be seeing past the edge of any given tile out onto the world beyond. (The process could be either additive, starting with an empty grid and adding one paper tile at a time, or subtractive, starting with a grid entirely filled over with blank tiles and working from the right edge inward, slicing away vertical rows one by one as one went along.) Once one was finished tracing, it would be a relatively simple matter to go back and tape the now drawn-over tiles together into that full concave scene, which would in turn read much truer to the lived experience of perspective than any traditional Renaissance windowlike approximation. All of which presupposed one were going to be willing to spend the hours and hours and hours to make it happen—which, given the history of these two particular young men, wasn’t likely to present that big of a problem. That, at any rate, was how the Twins did indeed spend most of their last year at Cooper Union. 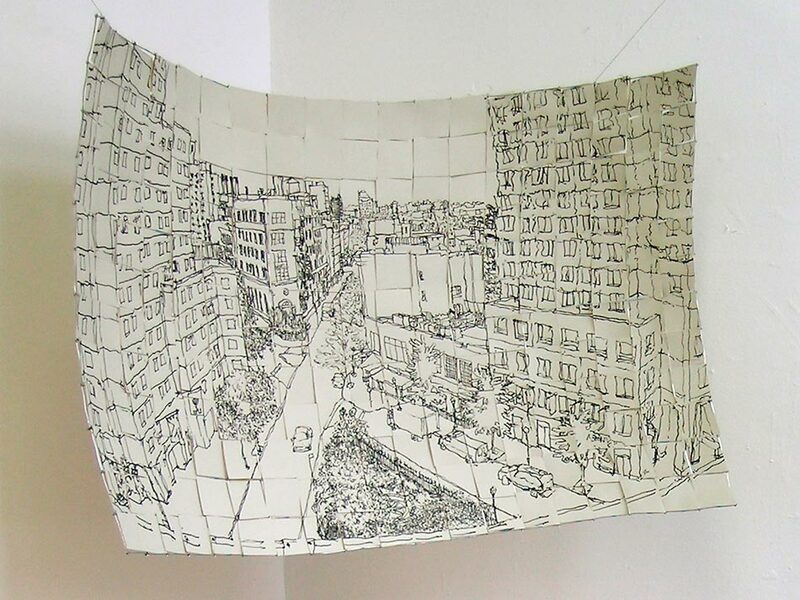 Their first grid did in fact take just about forever to fashion, what with having to calculate and recalculate the dimensions of each square, and then to contrive the pieces of paper to fit. And since they had fashioned the grid out of soft wire, it only lasted two drawings. A second grid, made out of slightly stronger wire, lasted hardly any longer, though it occasioned somewhat more assured images. 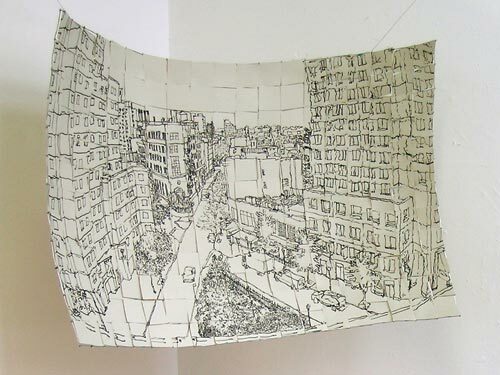 Early concave grid drawing with nose-like public square in foreground. 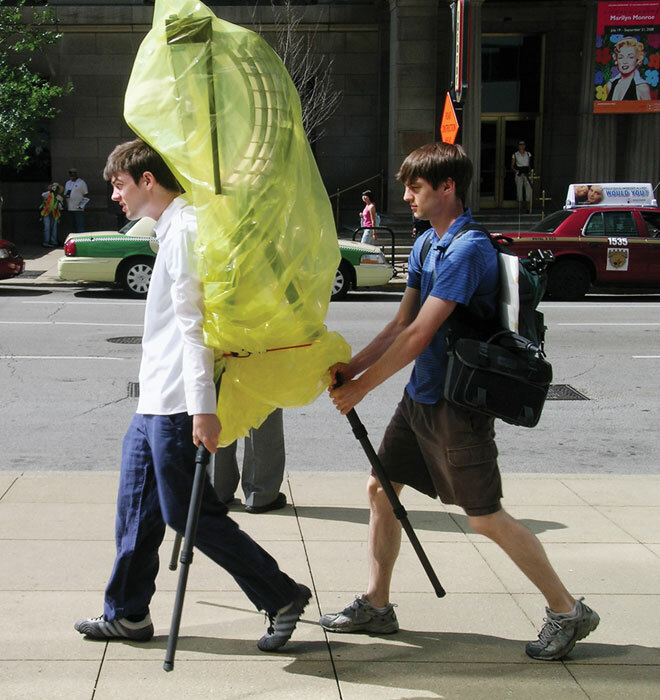 Upon graduating from Cooper Union in 2004, the boys started cobbling together a livelihood by working as studio assistants to artists further along in their careers, landing occasional jobs in interior design and construction, and, increasingly, by custom-crafting ever more exacting paintbrushes for artists ranging from Cecily Brown (one of their former teachers at Cooper Union) to Alex Katz. 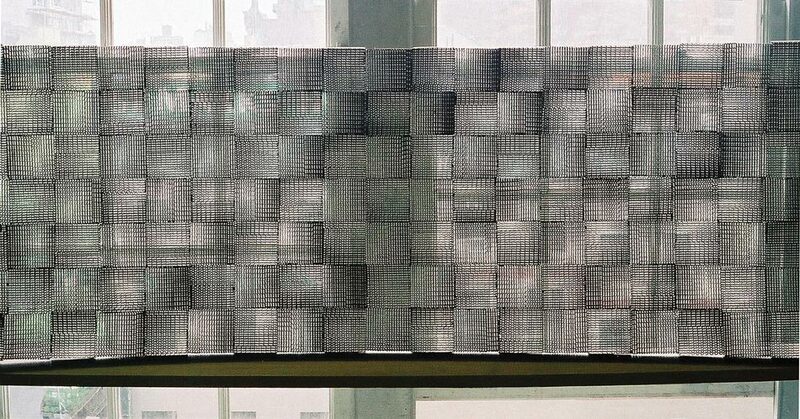 Meanwhile, though, they poured the greater part of their energies into fashioning a more durable concave grid, this time precariously welded out of sheet metal (a whole adventure in itself). 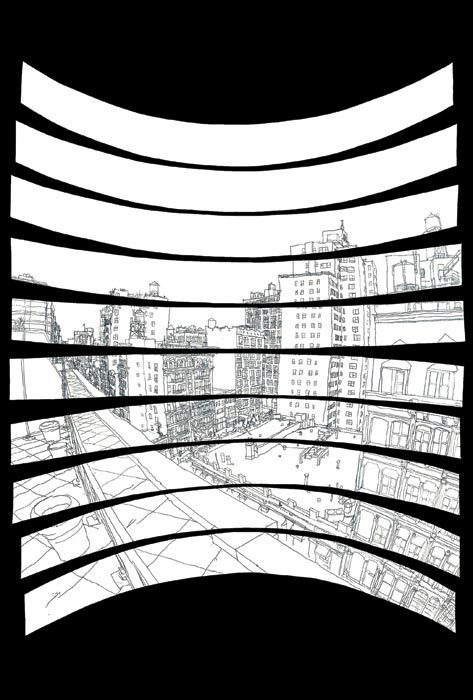 Within a couple of weeks of that grid’s completion, however, they received their first commission: the view from the roof of the Union Square Cinema. Their patron had a friend who was selling his apartment next door (with a virtually identical view) so as to be able to move back to London, and the guy wanted to offer that friend this extravagant souvenir. The thing is, once the boys had completed the drawing, the patron liked it so much that he wanted to keep it for himself. (I, too, am especially fond of this one: in particular the exceptionally realistic way the foreshortened ledge seems to fall away to the left—exactly the sort of effect that tends to get distorted in more conventional perspective renderings.) The patron asked if they could make him a copy for his London friend so that he could keep the original, which now afforded them the opportunity to develop a system for the meticulous reproduction of these concave drawings. Indeed, once they spread the curved strips out flat again, the resultant butterfly splay could be photographed and blown back up to identical size as the basis for an exact copy, or else either bigger or smaller (the latter forming the basis for a series of jewel box—or rather, actually, Lucite baseball collectors’ box—editions of subsequent drawings). Shortly after that, they learned that the top floor of the Chrysler Building with its tall tight triangular windows was momentarily vacant and somehow managed to procure permission to set up shop up there for several weeks, eventually emerging with their most ambitious cityscape to date, the entire northern Manhattan skyline vividly splayed out below them. Occasional photographs documenting the process—Trevor clambering into position at the optical cockpit behind the concave easel—formed the basis for another striking series of modular works. Trevor and Ryan carrying the vision machine. And so they continued on, one such concave drawing after the next, each one taking several days, sometimes several weeks to draw. Generally speaking, it was Trevor in the drawing cockpit (for one thing, he had progressively honed the ability to decouple the focus of his two eyes for hours at a time—not an easy thing to do even for a few minutes: just try it). Indeed, with this particular body of work, Trevor had taken the conceptual lead, though Ryan was every bit as involved in realizing the cumulative vision. “Ryan is the more down to earth of the two,” Lawrence Cacciatore, a Cooper Union administrator and longtime fan and observer of the Twins’ work, surmises. “Trevor gets it all spatially configured and conceptualized, but there’s something missing, and Ryan fills that gap: he helps bring the project in.” Something like one of those fraternal Hollywood director-producer relationships, I hazard. “Yeah,” Cacciatore agrees, adding, “As it happens, I’m an identical twin myself, and I can understand what it means to want to complete your brother’s thought or enterprise, not as a matter of competition or dominance, not for you to be the one completing it, but rather such that it will be complete.” Meanwhile, as the months passed, Trevor’s hand was becoming more and more assured, the sheer draftsmanship evidenced in the tracings becoming ever more authoritative. 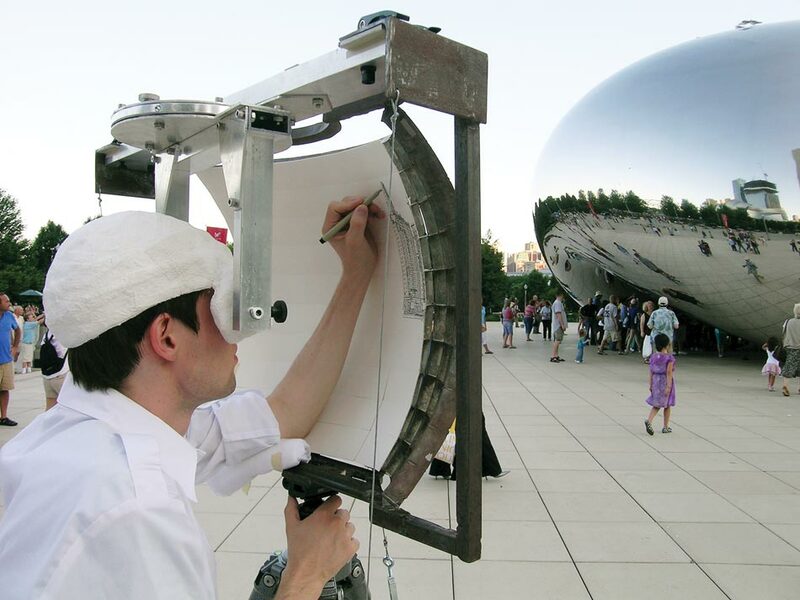 Trevor in his vision machine, drawing Anish Kapoor’s Cloud Gate in Chicago. 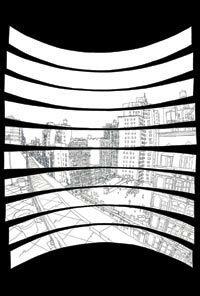 The Twins completed the drawing of the Bean and set off down the street to start work on another vantage, this time of the Spertus Institute’s startlingly fractured postmodernist glass façade jutting out into the rest of South Michigan Avenue’s urban cliffscape. Meanwhile, they also set to work on a fresh project. Working with the Pollich Tallix artists’ foundry in upstate New York (host of projects by the likes of Jeff Koons, Roy Lichtenstein, and Claes Oldenburg), and with the backing of some patrons, they were going to be taking the Bean drawing and blowing it up onto a ten-by-ten-foot aluminum concave shell, for eventual display, come the spring, right there in Millennium Park at the side of the Bean itself— the better to allow passing visitors to gauge the full effect of the method, and the full marvel of their own capacities for depth perception. Looking further into the future, the Twins talk about how they’d someday like to contrive a similar blowup of one of their images as big as the entire far wall of a long gallery space. Beyond that, Trevor and Ryan are entertaining other schemes as well, including their own crack at the Holy Grail of perpetrating a convincing stereoscopic 3-D illusion without any further equipment (goofy eyeglasses, cumbersome View-Masters) than the viewer’s own two eyes and visual cortex. Of all their future projects, however, arguably the most intriguing may involve a revisioning of some of mankind’s earliest visual manifestations. Because remember that double ghosting thumb—the way nearby objects double up at the forefront of the visual field when one is focusing off in the distance (even though we have grown so inured to this phenomenon across the dailyness of our lives that we no longer notice it)? Lately, in their spare time, Trevor and Ryan have been surveying imagery from Neolithic cave art all over the world. Could it be, they’ve recently taken to wondering, that the doublings of silhouettes one keeps encountering everywhere were meant to betoken the relative closeness of the animal in question—or, even more beguilingly, that in the olden times, before our distant ancestors had grown inured the way we have, that was just the way they actually went around experiencing the world? Just wondering, as one always seems to be doing when one finds oneself hanging out with the Oakes Twins these days. Just wondering.